"We're in a cage. With birds of prey" might sound like something lifted from the script of I'm Alan Partridge, but it was actually a genuine exclamation from Claire during our visit to Budapest's rather odd zoo. It really was one of the most curious places we've visited together. At one point you followed a trail which led you through several enclosures with geese and ducks. You then had to cross a little lake on a rather bouncy rope bridge, and then go through a metal gate into a narrow passage between some rocks. 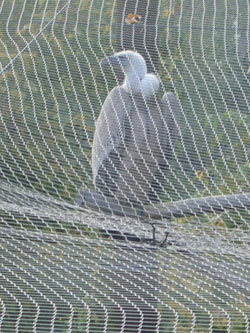 That was when we noticed we were now in the enclosure with the eagle and the vulture and some lumps of dead meat for them to feed on. I don't know whether they had their wings clipped or their claws trimmed, but they still looked like they could have your eyes out if they wished. 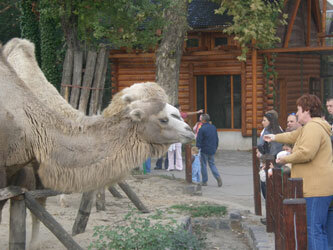 The zoo was a real mixture of interesting modern ways to display animals, and grotty run-down bits. The penguin and seal enclosure included a tunnel where you could watch them underwater behind the glass, and the larger monkeys were kept in a building where they seemed to have plenty of things to swing on and play with. Some bits seemed really poorly kept. There was a petting zoo area, and we initially rushed in excited by the sight of some enthusiastic young prokers, but then recoiled in horror from what must be Europe's smelliest public pig enclosure. Despite their pleading and whining, we couldn't bear to touch the dirty little piggies. 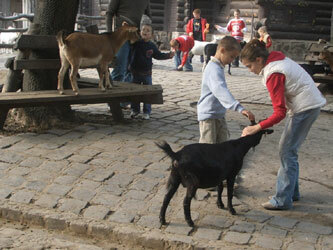 In another part of the petting zoo must have been Europe's hardiest goats, as they were absolutely swamped with children - we saw one child wrestling a goat by the horns, whislt another was being chased by a goat desperate to snack on their trailling scarf. Another strange aspect of the zoo was that people were able to buy nuts and pellets and feed the animals - and I don't just mean the goats in the petting zoo. The camels and giraffes were quite happily standing at the edges of their enclosures, mouths agape, waiting for people to feed them. The giraffe had its tongue poking through the fence so that people could place food pellets on it. 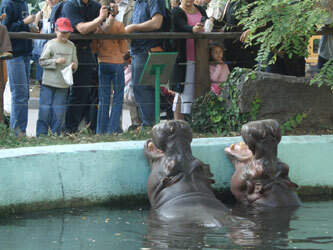 The most unlikely sight though was two hippos, with their heads sticking out of their water, mouths agape for kids to throw food at them. It was literally like watching the "Hungry Hippos" game in real life - although I don't think I would have let any children in my charge that close to a hippopotamus, which despite their appearance are actually quite quick and dangerous in the wild. 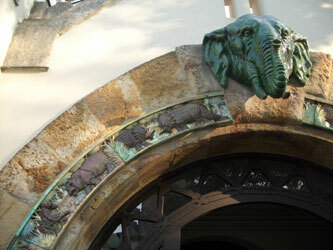 Architecturally the highlight of the visit was the elephant house. This art deco building has been lovingly restored, and boasts some great carvings of animals including dinosaurs, and an incredibly decorated dome with an elephant motif. The building was so impressive that we barely even noticed that there were some elephants in it. We spent a good two hours there, and with a special discount for paying cash, it worked out really cheap at just 1600HUF for the two of us – around €6.